Jovanka Beckles knows all too well how capitalism is an assault on working people’s health and well-being. As a social worker, she meets with children every day who suffer from severe asthma and other respiratory problems—not to mention the social and and financial costs that compound when working families have to cope with these chronic illnesses. Worst of all, these health problems are no coincidence; for years now, the people of Richmond, CA have been struggling against the Chevron oil refinery in their town and the environmental and public health impact of its rampant pollution. 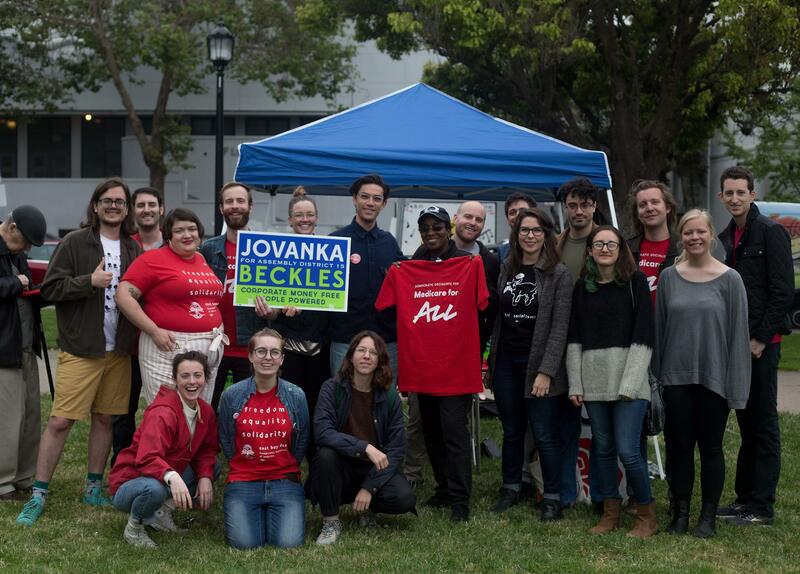 Jovanka Beckles led this fight as a two-term City Council member backed by the Richmond Progressive Alliance, a coalition of corporate money-free politicians and organizers who took on Chevron and imposed $115 million in taxes on them, in addition to new environmental regulations to keep their community healthy. As part of the RPA, Jovanka helped fight back against corporate greed to address the devastating public health effects of the Chevron refinery. 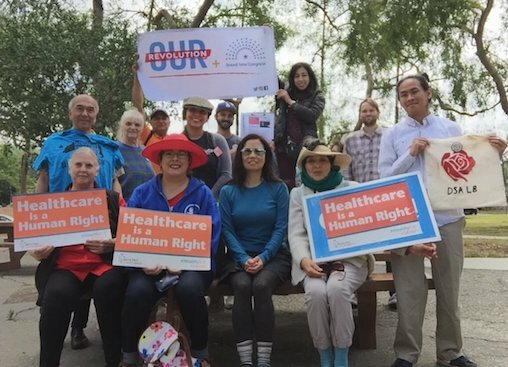 Members of DSA Long Beach and Our Revolution campaign for single-payer health care in April 2018. On a sunny August morning, Marlene Alvarado asked her fellow DSA members a probing question: "what motivates you guys to come out and, without getting paid, knock on people’s doors in this heat?" The temperature registered 80 degrees at 10 AM, but the real heat was on the friends and family members of the canvassing crew. Patty Clark’s son has battled a rare disease for the last 35 years. Overcoming a chronic condition takes willpower and courage. Unfortunately, in the United States, it also requires stacks of cash and an unflinching determination to push back against a health insurance industry that is always looking to deny coverage. Patty is happy to tolerate the warm weather, but she refuses to put up with the vultures who would like to wrest coverage away from her son. Originally published online at Jacobin, August 13, 2018. Bernie Sanders speaking to a crowd of nearly 1,600 students at Roosevelt High School in Des Moines, IA on Thursday, January 28, 2016. Photo by Phil Roeder. 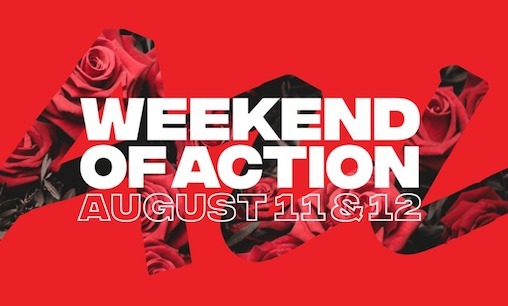 This past weekend, over 40 DSA chapters across the country took part in our second national #MedicareForAll Weekend of Action! We talked to our neighbors about bills like U.S. Senator Bernie Sanders' Medicare for All Act (S.1804), and its house counterpart, the Expanded and Improved Medicare for All Act (H.R. 676) - which provide a single-payer, comprehensive, universal healthcare system in America. Some chapters tabled, canvassed, or held town halls. Some integrated their work with DSA endorsed candidates like Julia Salazar for State Senate and Jovanka Beckles. Others trained new canvass leaders, did banner drops, or defended reproductive rights. This piece was originally published in Dissent's Spring 2018 issue, in a special section on Healthcare for All edited by Adam Gaffney. Support for Medicare for All has never been greater, and the failures of incremental reform have never been so clear. Our demand for a federally funded single-payer Medicare for All system has fast become the leading issue for insurgent democratic socialist politicians. And it has captured the imagination of the working-class majority too. 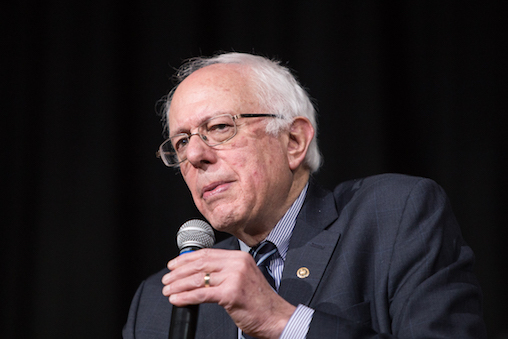 Recently, Representatives Keith Ellison, Pramila Jayapal, and Debbie Dingell announced the new Medicare for All Caucus in the House. Single-payer will soon be a litmus test for all politicians. This is in no small part thanks to our work in DSA. 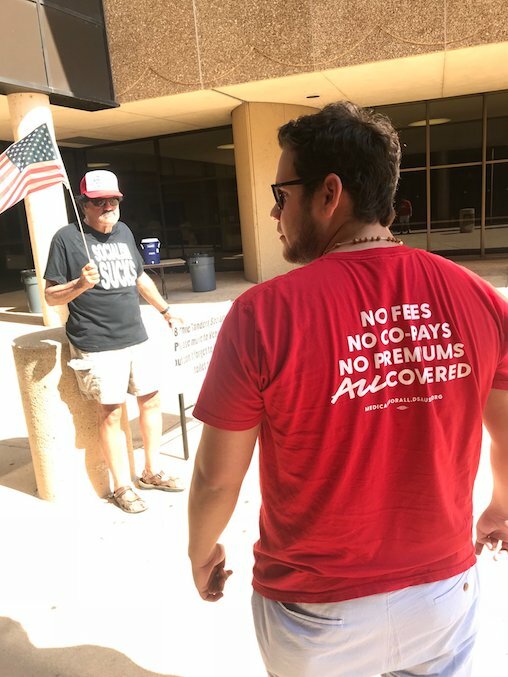 Every week, thousands of members are organizing across the country to pressure elected officials and talk to their neighbors, co-workers and family members to broaden the support for Medicare for All. We’re building the movement for a piece of real democratic socialism. However, we have a long road ahead. The Trump administration and the billion dollar lobbying operation launched by the insurance industry are dead-set on discrediting the Medicare for All movement. Moreover, our threats are not limited to them. In many ways, we have a more insidious danger to confront: the liberal establishment. Originally appeared on Huffington Post on July 5, 2018. 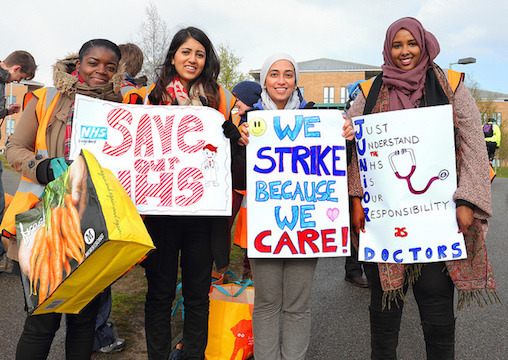 National Health Service Junior Doctors on strike outside Norfolk and Norwich University Hospital over cuts to NHS programs, April 2016. 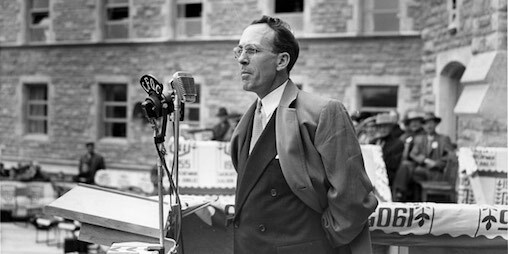 Photo: Roger Blackwell. At the beginning of the 20th century, British health care was in shambles: fragmented, inadequate and largely propped up by private philanthropy. In 1911, the liberal government introduced the National Insurance Act, but it was very limitedand covered only workers, not their dependents. Originally appeared on Vox, on July 13, 2018. The movement for Medicare for All is something to be reckoned with — but we need to keep the pressure up. It's great news that House representatives are forming a Medicare for All caucus, but, as DSA members have written in Vox, we need to keep them fighting for our interests and not those of private insurers or pharmaceutical companies. Read the whole piece by DSA M4A organizers here. Tim Higginbotham and Chris Middleman are organizers on the Democratic Socialists for Medicare for All campaign's Communications Subcommittee. 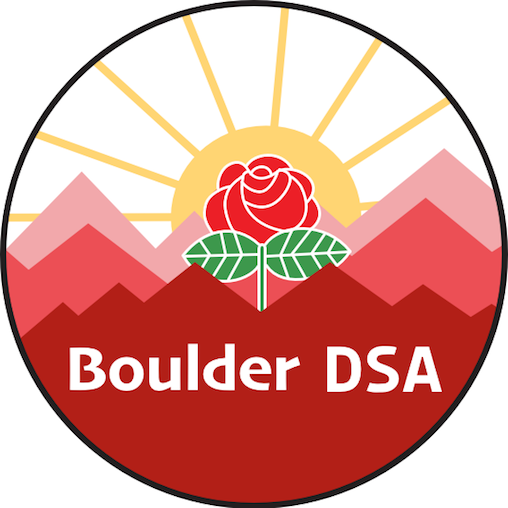 Last month, after a long canvassing campaign, the Boulder Democratic Socialists of America held a Medicaid Sign-up Event at a local library. As a steady stream of applicants arrived, a dedicated staff of volunteers were on hand to assist anyone who might have been eligible for state Medicaid benefits with the online application, and to walk them through the process step-by-step. The response from the community was overwhelmingly positive, and now we are pushing the boundaries of our campaign farther into the neighboring town of Longmont, where we will be holding another sign-up on July 21st. Longmont, a huge part of Boulder County, has been heavily affected by the exponential wealth growth in the area over recent years, where life has become increasingly difficult for the working class. 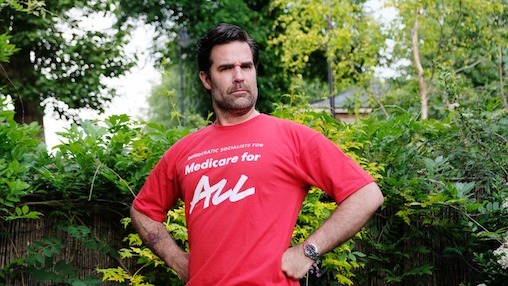 Just days before the UK's National Health Service’s 70th anniversary, writer, actor and comedian Rob Delaney is sharing a powerful message: winning healthcare for all Americans is not only necessary, it’s achievable within our lifetimes. Delaney spoke to DSA Medicare for All about his personal connection to the M4A movement, explained how a truly universal healthcare program is affordable and achievable, and encouraged people to get involved. Delaney is an American citizen born in Massachusetts and now living in London with his wife and two children and an active member of the DSA. While he’s widely known as the co-star and co-writer of the TV show Catastrophe, and recently starred alongside Ryan Reynolds in Deadpool 2, he is also an outspoken democratic socialist with a deeply personal connection to the Medicare for All movement. In the video, Delaney describes his struggle to afford healthcare for himself and his family while living in the US, which is an all-too-familiar struggle for millions of American families. After the family moved to London in 2015, Delaney says the country’s comprehensive healthcare program, administered by the British National Health Service (NHS), radicalized his views on healthcare.